Consider these three dog foods to help ensure that your dog’s nutrition remains balanced but also that their vitamin levels are maintained and that they grow up healthy and without any bone issues. This is especially crucial for when your dog is still a growing puppy. Those important stages of life are when your companion needs to keep their nutrition at its best. Crave is a popular brand known for its grain-free formulas. But there’s a real solid benefit to this particular dog food. It is absolutely rich with vitamin D. That is because salmon is the number one ingredient in this bag and salmon is rich in vitamin D thanks to its fish oils and meat. At 34% protein in its formula, your dog will surely get their proper vitamin D for excellent bone health as well as the protein for proper muscle growth and maintenance. And if you’re worried about filler ingredients, you won’t need to. There are no fillers, nor are there artificial colors, flavors, or preservatives. 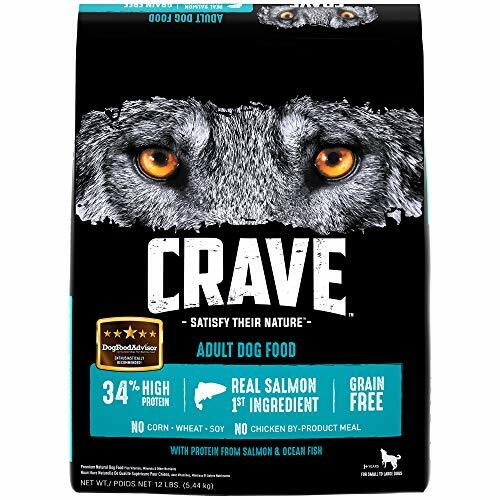 And best of all, for a high-quality dog food, Crave Grain-Free Adult Dry Dog Food with Protein is one of the more moderately priced ones, so you won’t have to worry about blowing your whole wallet on this dog food to make sure that your dog gets their proper nutrition. This one is one of the more economical choices, while also providing a good amount of dog food per purchase. 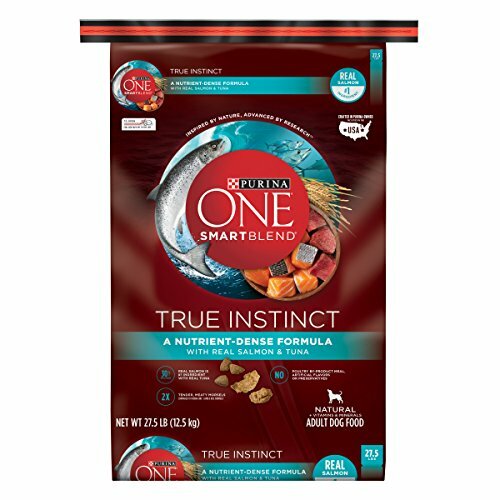 The Purina ONE SmartBlend True Instinct dog food contains 30% protein, with salmon and tuna being its two top main ingredients. With fish meat and fish oil in generous amounts, this dog food is rich in vitamin D (from both protein sources as well as vitamin D supplements) and omega-3 fatty acids. Aside from ensuring healthy vitamin D levels, these ingredients also help ensure your dog has a healthy and shiny coat. And it’s packed with antioxidants to help support your dog’s heart health in the process, too. Salmon is also rich in glucosamine, which promotes joint health and acts well in concert with vitamin D helping your dog’s bone health. Together, your dog will grow to have healthy bones and joints and will be less likely experience bone or joint problems later down the road. This is an important detail if you have a large breed. So, while your dog is getting its dose of vitamin D, he or she’s also benefiting from all these other great health-giving properties that salmon and tuna provide. And again, this dog food is particularly kind on the wallet too, so now there’s a way to always make sure your dog is getting his or her nutrition and vitamins. This is among the best dog foods for rickets period. 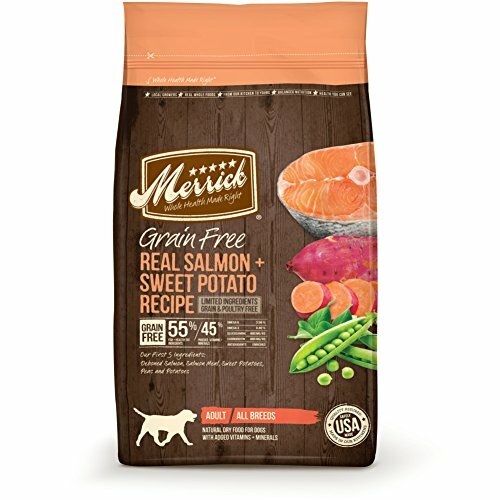 Merrick’s Grain-free Real Salmon and Sweet Potato Recipe is rich with vitamin D sources thanks to its plethora of meat sources. Its first ingredient is actually deboned salmon followed by rabbit, turkey, lamb, and pork. The salmon provides both protein but also the essential Omega-3 fatty acids. This is easily one of the more comprehensive protein and vitamin D rich dog foods, and its quality is also reflected in its price as it is the priciest in cost per pound on this list. In the listed ingredients, there are also other vitamin supplements including vitamin D3 and vitamin B12. You can be sure that your dog is getting everything they need from a serving of this dog food. Also, this formula is poultry-free, meaning if you have a dog that is sensitive to chicken, you won’t have to worry about it here. And you also won’t have to worry about where it’s from as this dog food is cooked right here in the USA, so you can be sure of its quality. So, if you’re looking to treat your dog to the best and ensure that he or she has their vitamin D in check, Merrick’s can take care of it. 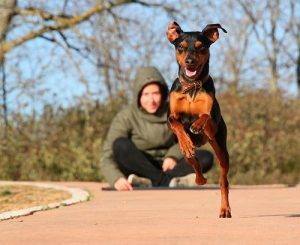 All throughout its life, your four-legged companion and best friend is going to need vitamin D for one reason or another. It’s the same reason why we humans need it. As growing youngsters, vitamin D helps with our bone growth and strength, it even benefits the strength of our teeth. As we get older, vitamin D still plays an important role in making sure our bones remain strong. But while young, without proper vitamin D levels, rickets can occur, which can result in weakened teeth, weakened bones, and even bone pain. With rickets, your dog may suffer from spine issues, or even a change in the shape of their skull as they grow. That’s because rickets targets particularly the growth plate areas of the bones. Your dog could end up walking bow legged or having pelvic deformities. These all can become lasting damages and affect a dog’s quality of life. To prevent that, make sure that they are always getting their proper nutrition. However, beware of going overboard with vitamin D. There is also such thing as toxic levels of vitamin D. So long as you make sure your dog is eating enough of the right stuff—i.e., getting the best dog food for rickets you can afford—you shouldn’t need worry. You and your four-legged best friend will have many happy years to spend together!